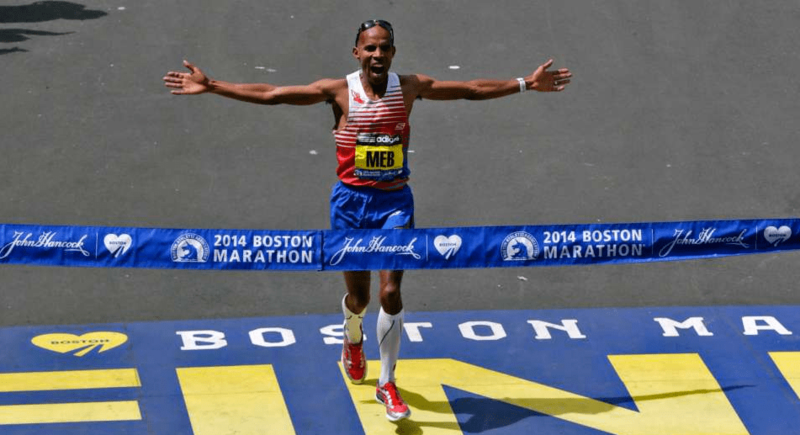 American Meb Keflezighi has won the Boston Marathon, a year after a bombing at the finish line left three dead and more than 260 people injured. Keflezighi is a former New York City Marathon champion and Olympic medalist. He ran the 26.2 miles from Hopkinton to the finish on Boylston Street in Boston’s Back Bay on Monday in 2 hours, 8 minutes, 37 seconds. Keflezighi held off Wilson Chebet of Kenya who finished 11 seconds behind. The 38-year-old from San Diego looked over his shoulder several times over the final mile. After realizing he wouldn’t be caught, he raised his sunglasses, began pumping his right fist and made the sign of the cross. No U.S. runner had won the race since Lisa Larsen-Weidenbach took the women’s title in 1985. The last American man to win was Greg Meyer in 1983. Keflezighi had the names of last year’s victims written in marker on the corners of his official runner’s bib. The names included the three people killed in last year’s marathon and the name of a police officer from MIT who was allegedly killed by the bombing suspect days later. Keflezighi said he hoped to have his picture taken with the victims’ families after his win Monday, but they weren’t immediately available. The victims were 8-year-old Martin Richard, 29-year-old Krystle Campbell and 23-year-old Lu Lingzi. MIT Officer Sean Collier was shot three days after the marathon.